Toyota’s CUE, a 6′ 10″ humanoid robot, has just been upgraded, and now it’s capable of shooting three-point shots like a pro – previously just free throws. This version, officially called CUE 3, uses various sensors to calculate the correct angle and force of a shot, while motors are used to repeat the same motion every single time for maximum accuracy. There’s still some work left to do, but it still managed to make five out of eight shots from the three-point line in the latest demonstration. Read more for the three-point showcase video and additional information. Famous Japanese drifter Daigo Saito has unveiled his latest drift car, and it’s based on the 2020 Toyota GR Supra (A90). Instead of keeping the stock engine, he opted to swap out the BMW-sourced B58 engine for Toyota’s legendary 2JZ-GTE twin-turbocharged 3.0-liter inline-six engine pumping out an impressive 800 horsepower, perfect for any D1 Grand Prix or Formula Drift event. The brand new vehicle also received some aesthetic upgrades, including a custom widebody kit, a large rear wing, and a new front bumper. Read more for additional pictures and information. Toyota unveils the GR Supra GT4 Concept, which will make its official debut at the 2019 Geneva Motor Show, held from March 7-17, 2019, in Switzerland. It was developed as a racing study model based on the GR Supra to explore the possibility of using the all-new sports car in customer motorsports such as privateer racing. This bespoke model is even lighter than the production Toyota Supra, and is equipped with race specific parts such as a roll cage, suspension, brake and rear-wings. Read more for a video, additional pictures and information. At first glance, it looks like any other modified 2017 Toyota Corolla, but watch it in-action at a Formula Drift event, and you’ll realize it’s a 1,000 horsepower drifting machine. Designed and built by Papadakis Racing, it’s powered by a turbocharged 2.7-liter four-cylinder with nitrous injection generating, mated to a four-speed dog box manual transmission sending power to the rear wheels. Other upgrades include 1050 cc and four 1700 cc injectors,two AEM 380 LPH fuel pumps, a Bryant Racing billet steel crankshaft, 10.5:1 forged JE pistons, Carrillo connecting rods, and a Portflow Design cylinder head. Read more for another video, additional pictures and information. The Fast & Furious franchise has been known for its outlandish vehicles, especially the Toyota Supra that late actor Paul Walker made famous, and that has inspired custom vehicle mashups, like this one. The last place you’d probably expect a Toyota Supra 3.0L inline-six 2JZ-GTE turbo engine is in a “hi-riser,” or in other words, a traditional, full-size, body on frame, V8 powered, rear wheel drive American-built sedan modified by significantly increasing the ground clearance. This 1973 Chevrolet Impala by an auto enthusiast named Craig may look normal at first glance, but it’s much more than meets the eye. Read more for a video showing why. Automotive designer and Photoshop guru Rain Prisk has given the all-new 2020 Toyota Supra a 4×4 off-road makeover, and it actually works. Featuring a set of large off-road wheels, custom arches, a front skid plate, pair of tow hooks, side steps, roof rack, and a snorkel should you encounter deeper than normal water. Just in case things get a little too deep, there’s even a kayak up top. Read more for another group of fascinating images from the web. Prior Design has revamped the 2020 Toyota Supra with a new front bumper, vented hood, flared fenders, a rear wing, modified suspension, and large wheels. No word yet on if anything was changed under the hood, but the factory model comes with a BMW-sourced 3.0L turbo-six generating 335 hp and 365 lb-ft of torque that enables it to hit 60 mph in 4.1 seconds, while the top speed is electronically limited to 155 mph. Read more for a picture of the rear and a video. 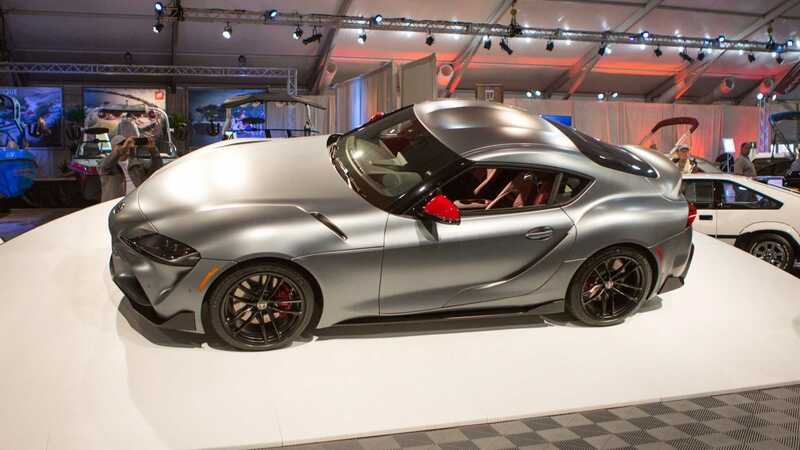 The very first production 2020 Toyota GR Supra to roll off the assembly line, “Global #1,” was auctioned at Barrett-Jackson in Scottsdale today for charity, and it fetched an incredible $2.1-million. All proceeds will go to support the American Heart Association(AHA) and the Bob Woodruff Foundation (BWF). There will not be another 2020 Toyota GR Supra like this one, as “Global #1” is the only VIN that will end in 20201 – with “2020” representing the year the Supra was reintroduced to the world and “1” marking it as the first vehicle to roll off the production line. Its exterior is also factory-finished with sleek matte gray color, red mirror caps and matte black wheels. Inside, you’ll find a red interior and carbon-fiber inserts representing the first of the launch edition for the U.S. market. Read more for an in-depth video tour, additional pictures and information.